You just can’t find a better romantic backdrop than the Northern California coast; and in that respect, remote Mendocino County tops the list. From the crashing waves along the rugged coastline, to the solitude of the coastal redwood forests, Mother Nature provides the perfect setting for a little romance. Add in a nice selection of small inns and intimate restaurants, and you have all the ingredients for the perfect romantic getaway. And although there are several accessible properties in the area, these two inns stand head-and-shoulders above the crowd. One property is new to the county, while the other was recently renovated; but they both get top marks for access as well as ambiance. 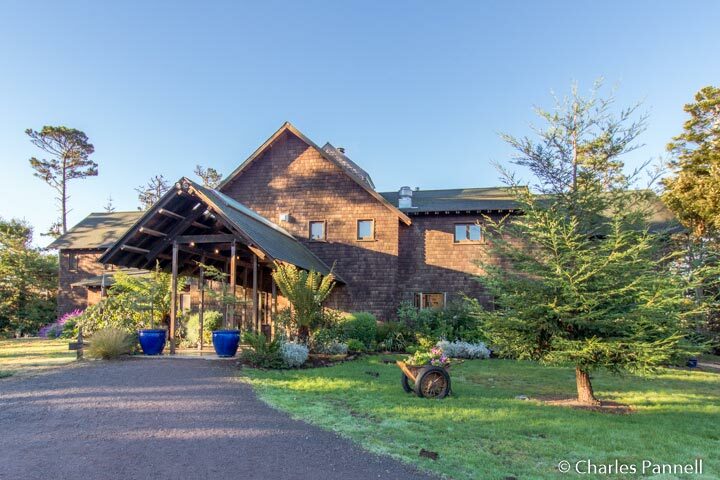 Located 20 miles north of the town of Mendocino, The Inn at Newport Ranch (www.theinnatnewportranch.com) is the new kid on the block. 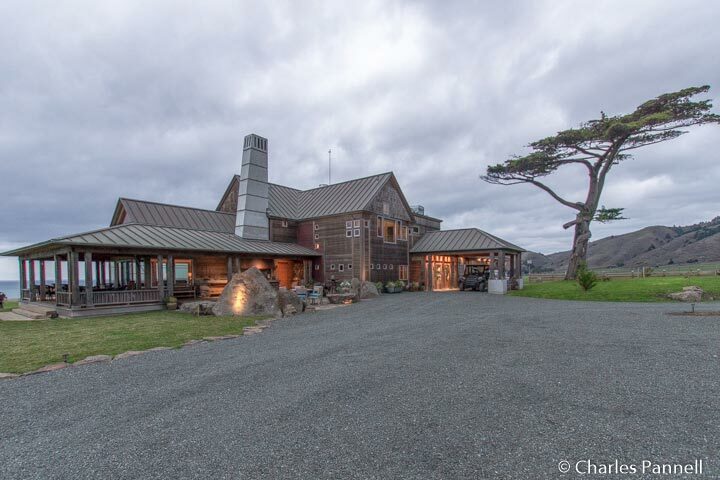 This six-room inn was constructed on the site of the former logging town of Newport, on a working 2,000-acre cattle ranch. After five years of construction, the oceanfront property opened its doors in August 2015. Access wasn’t overlooked in the construction either. Accessible parking is located near the front door in a crushed gravel lot, with level access through wide doors to the main building. Inside there’s barrier-free access to the library, living room and dining area, with level access to the wrap-around ocean view deck. 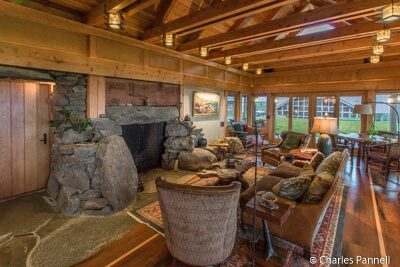 A massive 20-foot wide stone fireplace — with some of the stones weighing over a ton — dominates the living room. The larger stones had to be hoisted in place with a crane, before the roof and walls were added. Equal attention to detail was paid to the construction of the living room floor, which features salvaged old growth redwood planks. In a word, the architecture and design are simply stunning, as they highlight the natural beauty of the Northern California coast. The accessible Newport Suite is located next door in the equally stunning Redwood House. The building is named for the 25-foot tall bark-on redwood trees that act as the support structure as well as add an interesting architectural feature. Form and function at its finest. It’s almost as if you are in the middle of a forest. Although there’s no designated parking directly outside the accessible room, there’s room enough to park right next to the level walkway that leads to the Newport Suite. Access features inside include wide doorways, level thresholds and good pathway access. 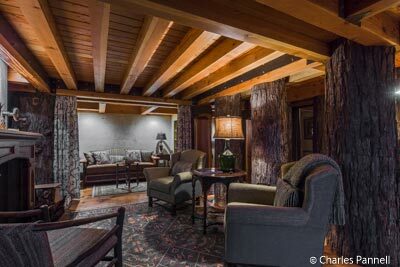 The suite features an open floor plan — a plus for ambiance and access — and it’s decorated with old logging photos of the namesake town. The living room features a wood burning fireplace with an antique mantle, with two easy chairs and a rocker surrounding it. There’s also a 14-inch high sleeper sofa tucked over in an alcove, with a privacy curtain to block off the area. The full kitchen features a refrigerator and stove and it’s equipped with a good selection of pots, pans and dishes. 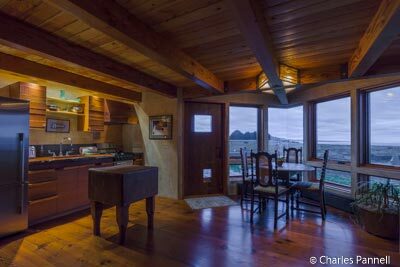 The adjacent dining room is surround by windows and offers a nice ocean view. Like the living room alcove, the bedroom area has a curtain that can be closed for privacy. 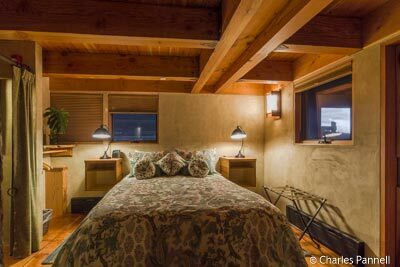 Its furnished with a 26-inch high queen-sized bed with wheelchair access on both sides. 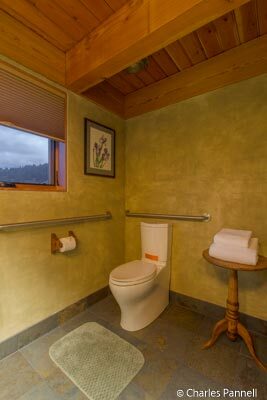 The adjacent bathroom features a full five-foot turning radius and is equipped with a roll-in shower with grab bars, and a fold-down shower seat next to the lowered hand-held showerhead. 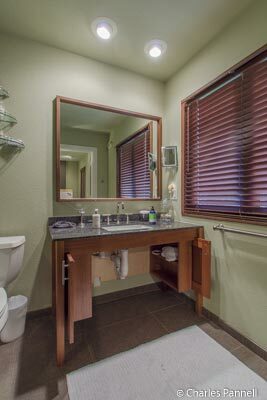 The toilet grab bars are located on the back and right walls (as seated), and the oversized double vanity features plenty of knee space for wheelchair-users. Out back there’s level access to the patio table and chairs, and there’s also a private hot tub in a small enclosure near the bedroom. All and all it’s a very spacious, comfortable and accessible room. Guests are treated to evening appetizers and wine by the fire in the winter, and by the outside fire circle in warmer weather. Both venues are equally accessible for wheelchair-users and slow walkers. A hearty ranch breakfast is also served in the morning. Suffice it to stay it’s substantial and includes, eggs, bacon, pancakes, pastries, fruit and a few ranch specialties. It’s the perfect way to top off a stay on the romantic California coast. 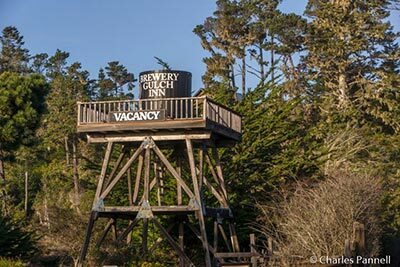 The Brewery Gulch Inn (www.brewerygulchinn.com) — located one mile south of the town of Mendocino — is also steeped in local logging history. Built in 2001, the property was sold to Guy Pacurar in 2007. “I was attracted to the design of the inn,” Pacurar recalls, “the fact that it was built from 150-year old reclaimed first growth redwood and its commanding site, perched high on a knoll with a picturesque view.” And although that earthy ambiance remains, Pacurar has added his own touches to the property over the years, including a newly renovated accessible bathroom in the Redwood Room. Accessible parking is available near the front door, with level access to the inn. 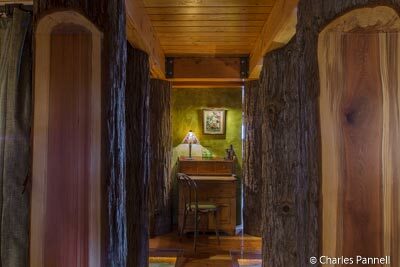 The first thing that you notice when you enter the lobby is the magnificent redwood that lines the walls and ceiling of the inn — and that wood has quite the history behind it. Back in the 1800s Mendocino was the site of a booming logging industry. As the story goes, remnants of that logging industry surfaced over 100 years later when some perfectly preserved 150-year old redwood logs were discovered buried deep in silt. Those logs — many of which were 16-feet in diameter — were salvaged and used to construct the inn. Today the lobby boasts a dramatic 14-foot ceiling, redwood-framed windows, and massive French doors which lead out to the spacious deck. And then there’s the handcrafted redwood reception desk. Everywhere you turn, there’s more redwood! The accessible Redwood Room is located on the first floor, right off the main lobby. Access features include wide doorways and good pathway access throughout the room. 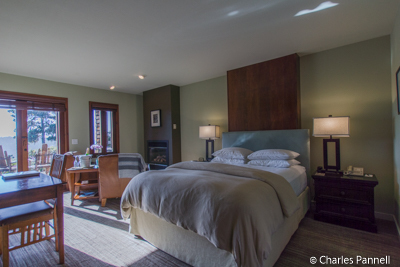 Furnishings include a 27-inch high queen-sized bed with wheelchair access on both sides, two night tables, a desk, and two comfortable easy chairs in front of the gas fireplace. There’s also level access to the back porch, which offers a view of the grounds and a glimpse of Smuggler’s Cove in the distance. The new bathroom is a sight to behold. 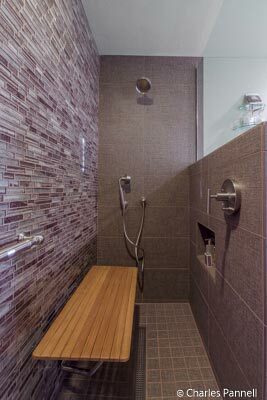 The previous modular roll-in shower was replaced with a custom-built version featuring ceramic and glass tiles. 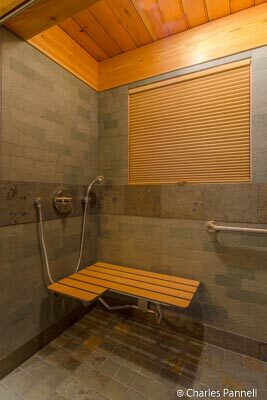 The fold-down shower bench is placed near the shower controls and the lowered hand-held showerhead, and the shower grab bars are attractive as well as functional. 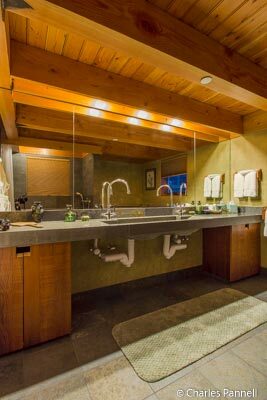 And the little details — like a lowered soap dish and towel bars — weren’t forgotten either. 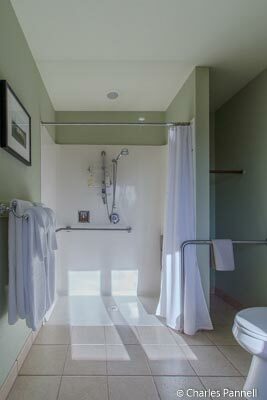 The old shower only took up three-quarters of the wall space, leaving an awkward gap at the end. Not only was it visually unappealing, but it prevented a toilet grab bar from being mounted on the wall. Instead, a ground-mounted toilet grab bar was used, which blocked full access from one side of the toilet. 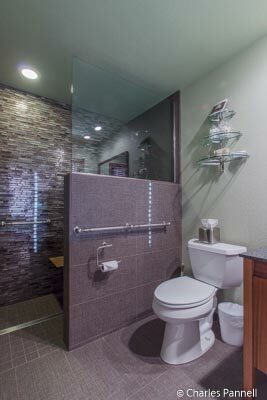 The new design features grab bars mounted on the right (as seated) and back walls, with greatly improved access. 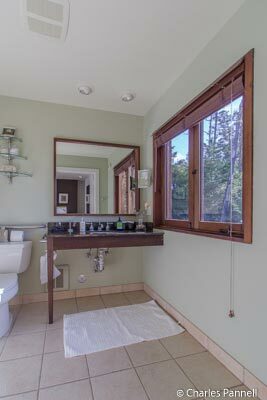 Although the whole room is very well done access-wise, my favorite design feature is the sink vanity. 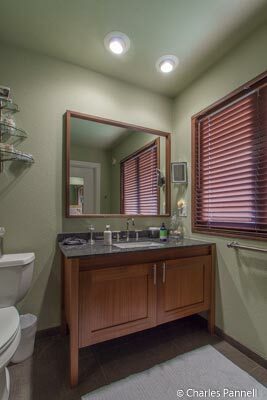 At first glance it looks like a standard vanity, but it opens up to reveal a roll-under sink. Even better, it doesn’t just look like an open cabinet — it looks like a piece of custom-built furniture. Truly it’s the most attractive roll-under sink that I’ve ever seen. Service is top rate at the Brewery Gulch Inn too, and their nightly light dinner buffet is the talk of the county. Although it’s designed as an appetizer, it’s substantial enough for dinner. Top it off with your favorite wine or beer, and you’re good to go until breakfast. The morning meal, which features locally sourced organic cuisine, is made-to-order. Be sure and try the millionaire’s bacon, as the sweet and hot flavor profile will definitely leave you wanting more. 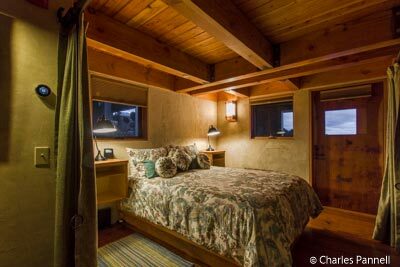 Bottom line — although the Brewery Gulch Inn is certainly a very comfortable property, it’s the homey touches and attentive staff that really push it over the top. The rafter of turkeys on the front lawn combined with the old water tower really set the mood for a true country experience; but the sinfully delicious caramels on my pillow, the welcome bottle of champagne and the receptionist who remembered my first name, definitely make me want to return again and again. And that’s exactly what I plan to do!